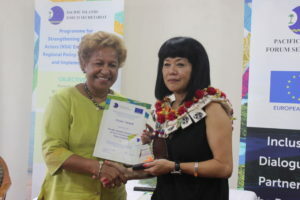 Suva – Pacific Islands Forum Secretariat’s (PIFS) award will support Pacific Islands Association of Non-Governmental Organisations (PIANGO’s) activities with Micronesian non-governmental organisation partners says PIANGO executive director, Emele Duituturaga. “This award will enable us to reach out to PIANGO Micronesian members and partners in the Northern Pacific. We have not been able to meaningfully engage with them due to high costs of travel and the lack of donor s support for programming activities in the sub-region,” she said. 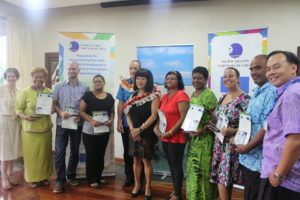 The award consists of grant assistance from the Pacific Islands Forum Secretariat aimed at supporting civil society work across the Pacific Region. This grant is funded through a partnership with the European Union (EU), as part of the European Development Fund 10, of which PIFS is the authorising entity. Duituturaga said traditionally, PIANGO’s focus has been the South West Pacific but the award will help support policy dialogue and targeted activities in the Federated States of Micronesia (FSM), Republic of the Marshall Islands (RMI) and Palau. “This award also covers a Pre-2016 Pacific Forum leaders meeting CSO roundtable and we will be able to support a number of other NLU representatives to travel to FSM and engage with our Micronesian NLUs,” she said. Duituturaga also stated that it will also provide opportunity to also engage with SPC who have a subregional North Pacific regional office in Pohnpei and explore opportunities to share resources to support CSO capacity strengthening. “This award sends a message to other donors and confirms that PIANGO is a reputable civil society organisation and our systems are up to the scrutiny,” she said.